You’ll have some of the orange honey chili sauce leftover. You can use it to season stir fries or fried rice. It should keep in the fridge for a week or two. In a saucepan, stir the orange juice and cornstarch, until the cornstarch is completely diluted. Add the honey, rice vinegar, red pepper flakes, salt, and onion powder. Stir everything together. Turn the heat to medium-high and bring the sauce to boil. Reduce the heat to medium-low, and let it simmer for another 2 minutes. Turn off the heat. In a bowl, toss the shrimp with 1/4 teaspoon kosher salt. Heat 1 tablespoon of olive oil on a skillet over medium-high heat. Once the pan is hot, add the shrimp and cook for about 5 minutes, flipping halfway. Remove the shrimp from heat, and toss the cooked shrimp with a few tablespoons of the orange honey sauce. Preheat the oven to 350ºF. Place an oven rack to the upper third and lower third position. Slice the bread in half. Arrange the bread slices on a baking sheet and slide the sheet onto the oven rack in the lower third position. Bake for about 8 minutes. The bottom of the bread should be very lightly browned. Remove the baking sheet from the oven. Turn on the broiler. Divided the shredded cheese on the toasted slices of bread. Broil the cheese for about 2 to 3 minutes, until the cheese melts. Be very careful here because the bread can burn very easily. Check the toast at 2 minutes to see if the cheese has melted. Mine were ready in 2 minutes. Remove the toast from the oven. 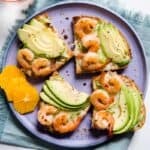 Top the bread with avocado slices, orange honey shrimp, black pepper, and sliced scallions. Serve immediately.